The new Advanced Engineering Building for the University of Queensland has earned two awards at the Australian Institute of Architects 2014 National Architecture Awards, claiming both The Emil Sodersten Award for Interior Architecture and The Sir Zelman Cowen Award for Public Architecture. Boasting a large range of sustainability features spread throughout the occupant focussed layout, Richard Kirk Architect and HASSELL have delivered a building that facilitates interaction between students internally whilst tacitly referencing the Queensland landscape externally. The building was named successful ahead of a strong field in both the Interior Architecture and Public Architecture categories from which the full list of awards can be found at the bottom of the page. “The jury was greatly impressed by this project, which has been designed as an open vessel for learning. Facilities and learning processes are highly visible to inspire both students and visitors. The architects have taken an extremely complex program – including teaching spaces, a 500-seat auditorium, laboratories, research facilities and office spaces – and resolved a building that is not only exciting to inhabit, but also a delightful space to occupy. “Set within the subtropical climate of the University of Queensland’s St Lucia campus, the building houses the School of Civil Engineering and the Queensland Centre for Advanced Materials Processing and Manufacturing. “Three volumes feed off a central ‘street,’ a scheme which works both in plan and in section. A sense of discovery pervades the building, with key spaces open to view and explained to assist the learning process. “The interior has a restrained yet rich material palette, which is derived from the sensitive use of local Queensland timbers – central to the project’s sustainability initiatives. 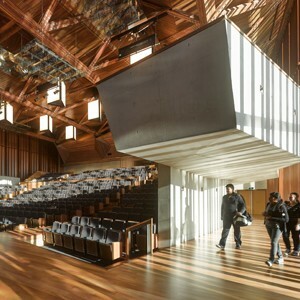 The use of local timber also connects the interior to the outside spaces, providing a clear sense of orientation within the building. Although the building is large, it is never overwhelming – the clear expression of the structure adds a directness and simplicity to the spaces within. Although it is an institutional building, the material palette has a softness more usually associated with residential architecture such as the terracotta external screening and the abundance of timber cladding. The same thoughtfulness extends to furniture and fittings, many of which have been purpose-designed for the project.